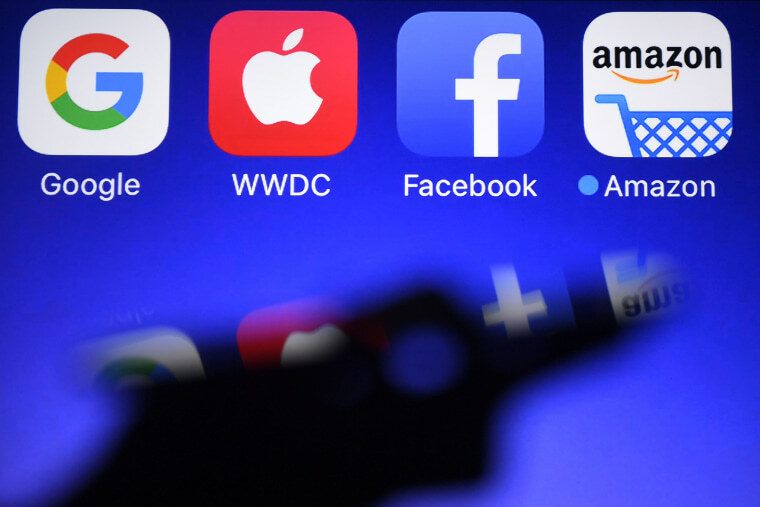 Political analysts spend a lot of time talking about what divides American culture, but in 2018, one could argue there are four common ties that bind most Americans on a vast array of fronts: Google, Apple, Facebook, and Amazon. In a world where modern communications technology has become ubiquitous, those four companies have quickly grown to play an enormous role in every facet of American life from where we shop, to whom we keep in contact with, to where we get our information. Everything from shoes to news. How big is the pull of America’s four tech behemoths? Consider some numbers. In November, Amazon’s market value was $591 billion, greater than Walmart, Costco, Target, Macy’s and 11 other well-known retailers combined according to a recent piece in Esquire magazine. It’s now valued at more than $722 billion. For Facebook and Google, you could add the value of the world’s top five advertising agencies with the value of five major media companies, plus five major communications companies, including Comcast, the owner of this website, and only get to 90 percent of those tech firms’ total value, according to Esquire. Apple, meanwhile, is more valuable than any of those companies, and at roughly $900 billion is the most valuable public company in the history of the world. That’s just the money though. These companies also rule in terms of market share in some very important areas. Google controls roughly 90 percent of the search engine market. Amazon holds 44 percent of online commerce and 75 percent of electronic books and 64 percent of U.S. households have a Prime account. Two-thirds of all U.S. adults have a Facebook account and about 45 percent of them get news there. Together, Google and Facebook collect more than 60 percent of online ad revenue. And between them, Apple and Google control 99 percent of the mobile operating systems that power the phone in your pocket or your hand right now. Those are the kinds of numbers that in the past have had politicians calling out for changes. In the late 1990s, Microsoft held about 80 percent of the desktop computer operating system market and was sued for being a monopoly. In 2001, it settled the case and agreed to share source code from its Windows operating system. And, of course, the government broke up AT&T in the early 1980s, because people really didn’t have a choice in phone service. It was a true monopoly. There are some important ways the big four technology companies are different than those well-known cases. Google and Facebook, for instance, are free. Anyone with computer or smartphone and a Web connection can use them at zero cost. Nobody forces you to use Amazon to shop. It’s not the only online shopping service. And no one makes people shell out $1000 to buy an iPhone X. There are plenty of alternatives out there. But even without monopoly pricing or forced usage, the reach of the big four tech companies is broader than past monopolies because the companies don’t control the phone lines or our software choices, they control information and how we see the world. Manipulation of that control is at the heart of federal probes and the ongoing arguments around the 2016 presidential campaign. And talk of Russian bots and fake news emerged again this week in the wake of the school shootings in Parkland, Florida. But even without nefarious doings, these firms are changing how we see and understand the world. The Wall Street Journal explored how tailored news feeds work and what they look like with its Blue Feed, Red Feed Project that allowed users to see how liberal and conservative-leaning users experience the news on a range of issues. Some of the sources that turn up frequently in the Blue Feed column: The Daily Show, Bernie Sanders’ news feed, Media Matters and the ACLU. In the Red Feed column: Breitbart, Rush Limbaugh’s news feed, LifeNews.com, and the Conservative Post. Those are the building blocks of two very different views of reality. And the tailored news impact extends beyond Facebook to Google, which personalizes search results based on factors including location, browser history and the devices we use. And, of course, Google News offers a personalized news feed for users so inclined. Outside of news, Amazon uses artificial intelligence to create a consumer world for us, offering items that it believes we might be particularly interested in purchasing. With the purchase of Whole Foods and the recent launch of Amazon Go stores, the Seattle-based company is expanding into the brick-and-mortar world where, one assumes, it will use the choices that dominate in a particular community to fill its shelves. And Apple and Google put the devices and operating systems in our pockets that bring all of these feeds and products to us at a moment’s notice, 24 hours a day. Together the big four tech companies help us create our own, curated realities; the cultural “bubbles” we all live in. What do we want to know about and what would we rather ignore? The big four do this through the data they collect from us and the systems they use to analyze that data. And we aid in their efforts with every search, every purchase, and every click. On its face that’s not good or bad. Arguably, it’s just capitalism at work, better service for consumers. But regardless of intent, the sheer size of the big four tech companies has increased their cultural and political impact. And as their influence becomes more apparent, Washington is now starting to wonder if, when and how it should step in to regulate them.